Förde Reederei Seetouristik started out as a regional passenger ferry operator founded in 1866 and now the Flensburg, Germany, based company has grown into an international business group and is one of Europe’s leading ferry operators. Nowadays FRS provides both conventional ferry high speed ferry services and, with 64 vessels and approximately 1,500 employees worldwide, the group transports around 8 million passengers and 2.2 million vehicles per annum. FRS now comprises approximately 25 subsidiaries located in Europe, North Africa, the Middle East and North America. With a core business of national and international ferry operations, the parent company also now specialises in Offshore Logistics, Port Management, Crewing and Maritime Consulting. This newbuild feature concentrates on the Förde Reederei Seetouristik service offered from Hamburg to Germany’s only offshore island, Heligoland. In 1984 what is now FRS took over the Heligoland traffic from KG Seetouristik and, in 1991, Förde Reederei GmbH and KG Seetouristik GmbH & Co. merged to form Förde Reederei Seetouristik GmbH & Co. KG (FRS). 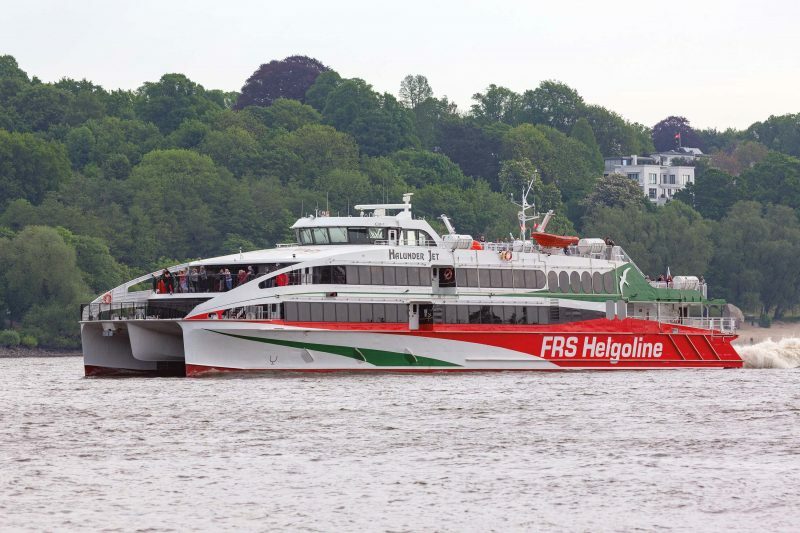 The Hamburg-Heligoland service now trades as FRS Heligoline GmbH & Co. KG and is the market leader to the island, conveying over 165,000 passengers annually. Heligoland is located 29 miles off the German coastline in the German Bight region of the North Sea and consists of two islands, the populated triangular 0.4 sq mile island of Hauptinsel to the west, and the 0.27sq. mile Düne to the east. The island of Hauptinsel is what the place name Heligoland is normally used to refer to and the smaller island is not permanently inhabited. Although culturally closer to North Frisia in the German district of Nordfriesland, the two islands are part of the district of Pinneberg in the state of Schleswig-Holstein. Heligoland was a colony of the British Empire 1807-1890, has a population of around 1,100 people and is a holiday resort that enjoys Duty Free status, as it is part of the EU but excluded from the EU VAT area and customs union. Consequently, much of the economy is founded on sales of duty free merchandise to tourists who visit the islands. An airport is situated on Düne with the main island boasting a harbour frequented by private craft plus the seasonal passenger ferry services from both Cuxhaven and Hamburg operated by FRS and Cassen-Eils, with the latter also providing a year-round link from Cuxhaven. The Hamburg-Heligoland high speed passenger ferry era dawned in 1997 when Speedways opened a service using the Vargøy, a 41m long, 477gt and 342 passenger capacity vessel built by Kvaerner Fjellstrand A/S of Norway. FRS joined this fast ferry trade from Hamburg in May 1998 when the 41m long, 466gt and 342 passenger capacity Baltic Jet, a near sister to the Vargøy, entered service. The vessel was then renamed Hanse Jet II. As these operations established themselves, the first fast ferry service to Heligoland from Cuxhaven, and also Austal Ship’s first 52m passenger catamaran, joined the party. Operated by Norden-Frisia, the 920gt and 432 passenger capacity Cat No.1 entered service on 9th March 1999. The vessel’s full sphere of operation was Cuxhaven-Heligoland- Norderney-Langeoog-Borkum-Eemshaven-Amrum-Hörnum. In 2006 she was sold to Linda Line, Tallinn, as the Merilin and in 2017 moved on to South Korea for a new career with Daezer Shipping Co. Ltd., Pohang. When these ferry services blossomed in the 1990s there was another rapid transit service along the River Elbe to/from Hamburg, namely Elbe City Jet Schnellfahren. Craft employed included the Hanseblitz, Hansepfeil and Hansestar. On 6th July 2002 FRS began trials using the larger Fjellstrand A/S built Flying Viking between Hamburg’s Landungsbrücken and Heligoland. In 2003 FRS took delivery of the 910gt/52m long and double-deck Fjellstrand (Norway) built Halunder Jet, a slightly larger version of the Flying Viking, for the Hamburg-Wedel-Cuxhaven-Heligoland service. The new arrival, with a passenger capacity of 579, entered service on 13th May 2003. The displaced Hanse Jet II was redeployed on a Cuxhaven-Heligoland service in May 2003 for the summer but this was not continued. The introduction of the Halunder Jet also saw Speedways bow out as the new vessel could carry more than the combined capacity of the Vargøy and Hanse Jet II. The competing craft would also have been shadowing each other on near identical departure times so Speedways effectively handed the Hamburg-Heligoland market to FRS. The Halunder Jet operated the shuttle service to Heligoland each summer season until October 2017, completing 22,000 hours of reliable operation, powered by MTU Series 4000 engines. Both the Vargøy and Hanse Jet II were eventually sold on for further service in Turkey and Greece respectively. The Halunder Jet (1) made her last round trip to Heligoland on 15th October 2017 after 15 years in service and departed Hamburg for the last time on 3rd November 2017 after refit at Blohm & Voss. She was renamed Victoria Clipper V and was shipped to Canada to join the FRS Group’s Seattle (USA) to Victoria (Canada) route, operated by Clipper Navigation. The need for greater capacity here was the catalyst for the project to build Halunder Jet (2). At this point it is worth mentioning the background to the choice of name for the 2003 built craft. Halunder (or Heligolandic) is the dialect of the North Frisian language spoken on Heligoland. It is still spoken today by some 500 of the island’s 1,650 inhabitants and is also taught in schools. Heligolandic is closely related to the insular North Frisian dialects of Fering and Öömrang. Heligolandic also contains a variety of loanwords from 19th-century Modern English due to the 83-year British control of the island.